When will TNPSC GR 2A Official Answerkey be published ? TNPSC Group 2A 2016 Official Answerkey will be published after 3-4 days of TNPSC Group Two Non Interview Exam 24-01-2016. 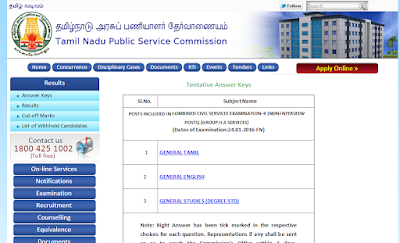 When TNPSC Group 2 A Results 2014 will be published ? TNPSC Official Answer Key for TNPSC Group 2A Exam, 29-06-2014 has been Released today at www.tnpsc.gov.in/answerkeys.html . After Checking the TNPSC Group 2A Official Answer Keys you can check TNPSC Portal's Expected Cut Off Marks for Group 2A Exam in the following link. [ Old Information ] You can download the following Private TNPSC Exams Coaching Centre's Answer Keys . Radian Answer Keys for GK, GT, GE are updated. Visit the above link.